My husband’s birthday is this week and he’s getting just one present… a portable jobsite table saw that he picked out himself. 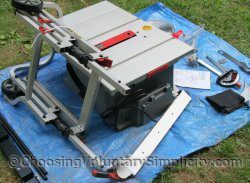 He spent a lot of time researching table saws, and the one he chose has the degree of accuracy and extra features that he needs when he builds furniture. 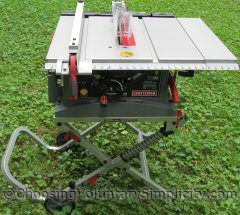 His old table saw is a thirty-nine year old workhorse that will still be used for less precise work. Actually, the reliability of the old saw is the reason my husband wanted to buy the same brand again. The brand is well-known and respected, although the company’s reputation isn’t what it used to be. Their closest store is about a two-hour round trip drive from here, so we were glad to see that the company’s online store had the saw in stock with free shipping included in the price. We wanted to be sure that the saw would be shipped from the warehouse and not from one of their many stores. We have had three previous bad experiences with merchandise we ordered online that wasn’t shipped by the warehouse. In each instance the merchandise we received was obviously either a shopworn display model or a damaged returned item. A comforter arrived without a box or bag and very, very soiled, with the shipping label taped to the comforter itself… a jacket arrived with ripped areas under the arms… and shoes had obviously been worn multiple times and returned. So before my husband ordered the saw, he asked the customer service representative to check that it was in stock in the warehouse and that it would not be shipped from any of their stores. He was assured that the saw would come directly from the warehouse, so he placed the order. An order confirmation arrived by email almost immediately and included a notification that because that particular saw was out of stock at the warehouse, the order would be fulfilled by one of the company’s stores. We were not pleased. My husband immediately called to cancel the order and was told the order could not be cancelled. The person he spoke to said that although there had been a problem in the past with stores sending shopworn or returned merchandise, she could personally guarantee that the saw would be new and in a factory-sealed box… that new policies were in place and all stores were required to ship only NEW merchandise. We were still not convinced, but we had no options. UPS delivered the saw two days ago. The box was ripped in three places and was so dirty and stained that much of the writing on the box was obscured. Despite the dirt and stains the box appeared to be factory-sealed and taped. All of the parts inside the box were sealed in plastic bags… including one part (the dust vent) that had a large piece broken off one side. The missing piece was not in the sealed bag or in the box, so it could not have been broken in transit. A few other parts were scratched and actually looked worn in places. As my husband checked each part against the included parts list, he discovered there were several minor parts missing, including all the nuts, bolts, and washers. And there was one major part missing… the blade! At that point we had had enough. Somebody had obviously repackaged a returned saw to try to make it look like new. My husband put everything back in the box and made the two-hour trip to the store to return that saw and pick up one that actually WAS new. Then he called the online service number and voiced our dissatisfaction with the service we had received… AGAIN. This customer service person apologized profusely and offered a ten-percent credit off the price of the saw, along with the assurance that this was a most unusual occurrence and that it would never happen again. It certainly will never happen again to us, because we will never buy from that company’s online store again. Did the credit for “the inconvenience caused by this order” (their description) compensate for all the inconvenience this order caused? For some people this would have been a rant against the company. Once again I am impressed by your discretion and tolerance. I’m 62 years old but I want to be like you when I grow up! They haven’t changed. I just returned a food processor that reeked of garlic. There was a circular abrasion around the inside of the bowl and a very greasy feel to the outside of the base. It was disgusting. Glad you were able to get the product you wanted. 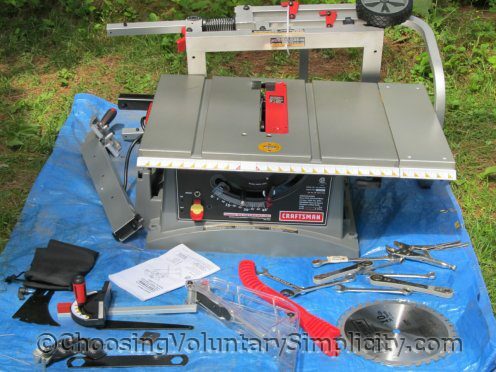 Nice looking saw – AND to have a husband who can make furniture – you’re one lucky lady! This company has been in trouble for some time. Maybe instances like yours, Shirley, are part of the reason. 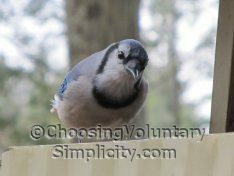 I find there is very little customer service and too much turn-over in staff. People just do not know the merchandise they are selling like they did in the “old days” when they had pride and (obviously) honesty. It’s too bad. They used to be a great place to shop for most anything. And remember those Christmas catalogs? Us kids would spend hours looking at the toy section. Sigh.